Pottermania is contagious. The books and the movies are a rage among kids all over the world. And now almost everyone is queuing up to watch the fifth of the movie series called "Harry Potter and the Order of the Phoenix". 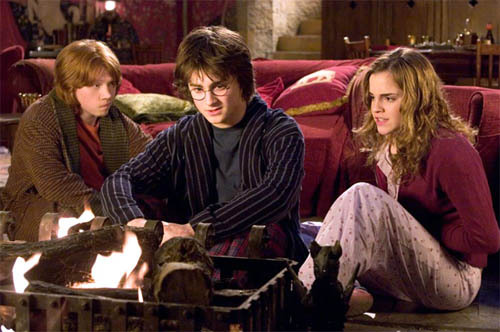 The film almost coincides with the release of the seventh Potter book by J.K. Rowling on July 21. The latest movie shows Harry Potter's fifth year at the Hogwarts School of Witchcraft and Wizardry and has been well received by fans. But the fifth movie edition isn't just for kids ... adults will also enjoy it as Harry, played by Daniel Radcliffe, has now grown into a teenage boy engaged in grown-up adventures. Harry has not only grown into a good-looking guy, this time he is angry and combating new fears within. He is also shown enjoying his first kiss with his classmate Cho Chang (Katie Leung). The film has its familiar premise, but the evil Voldemort's return to power is not the only factor that worries Harry now. There is trouble in the form of Dolores Umbridge (Imelda Staunton), who enters Hogwarts as a teacher with vengeance and contempt for its students and faculty. And she leaves no chance to show her detestation towards them. She bans students from practising magic and insists on giving just theoretical knowledge. So Harry challenges her by giving his fellow pupils magic lessons secretly, though Dolores manages to penetrate into their secret chamber. And amidst all this, the students also have to give their final exam. From the FX to performances and adventures to dark secrets, everything is in place - the animation and special effects are best in the climax. The fireworks triggered off by the Weasley twins during their final exam are awesome. Though described as the darkest movie in the series, it is the weakest compared to the last four. But at the same time, the film's tone and texture is definitely dark. Ron (Rupert Grint) and Hermione (Emma Watson), Harry's closest friends, have also grown up, but this time they don't have much to contribute. Potter fans will surely enjoy Radcliife's performance as a brooding teenager - the boy wonder not only looks good in the film but also plays his part with finesse. The film may not appeal to first timers but will certainly be a hit with old Harry Potter loyalists.